Noting the startling advances in semiconductor technology, Intel co-founder Gordon Moore proposed that the number of transistors on a chip will double each year, an observation that has been born out since he made the claim in 1965. Still, it's unlikely Moore could have foreseen the extent of the electronics revolution currently underway. Nongjian "NJ" Tao and his collaborators recently described a series of studies into electrical conductance through single molecules. Creating electronics at this infinitesimal scale presents many challenges. In the world of the ultra-tiny, the peculiar properties of the quantum world hold sway. Here, electrons flowing as current behave like waves and are subject to a phenomenon known as quantum interference. The ability to manipulate this quantum phenomenon could help open the door to new nanoelectronic devices with unusual properties. "We are interested in not only measuring quantum phenomena in single molecules, but also controlling them. 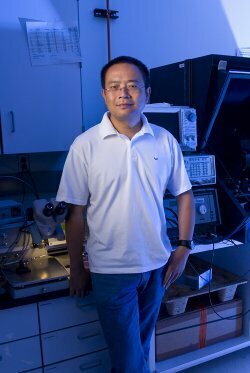 This allows us to understand the basic charge transport in molecular systems and study new device functions," Tao says. Thousands of conductance versus distance traces were recorded, with the particular molecular properties of the two molecules used for the experiments altering the electron flow through the junction. Molecules in the 'Para' configuration showed higher conductance values than molecules of the 'Meta' form, indicating constructive vs destructive quantum interference in the molecules.